Local foods and agriculture are helping reshape our local economy. New restaurants, craft beverage producers, and farmers markets alone have generated interest and excitement across the Southern Tier. On October 24th, I joined Volunteers Improving Neighborhood Environments (VINES) to celebrate National Food Day which encourages communities to advocate for improved food policies. I was also happy to announce a $5,000 Assembly grant I was able to secure for VINES’ Grow Binghamton program, a summer employment program that trains at-risk youth in urban agriculture. This funding will be used to purchase equipment and supplies for the young people participating in Grow Binghamton. With the local foods movement growing, programs like this are helping prepare the next generation of entrepreneurs and producers. You can read more about Food Day by clicking here. 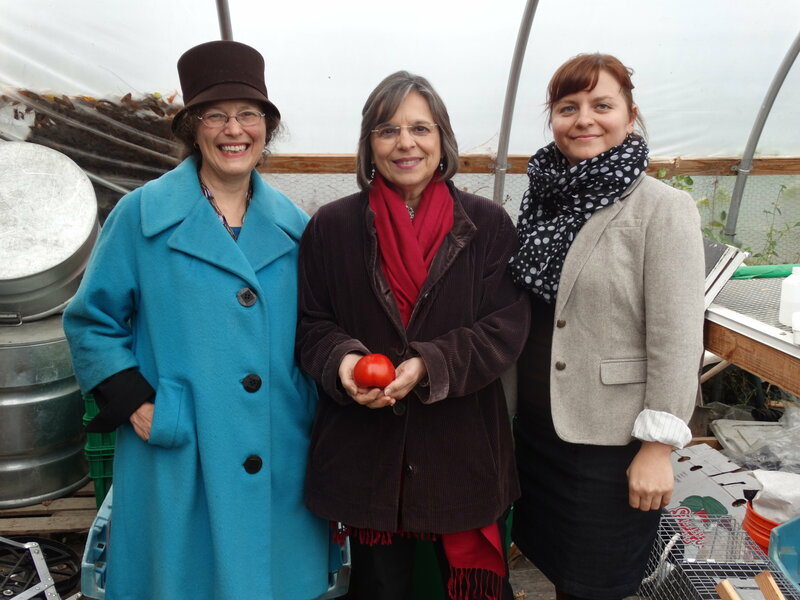 Assemblywoman Lupardo with VINES Board Chair Amy Shapiro and VINES Executive Director Amelia LoDolce. 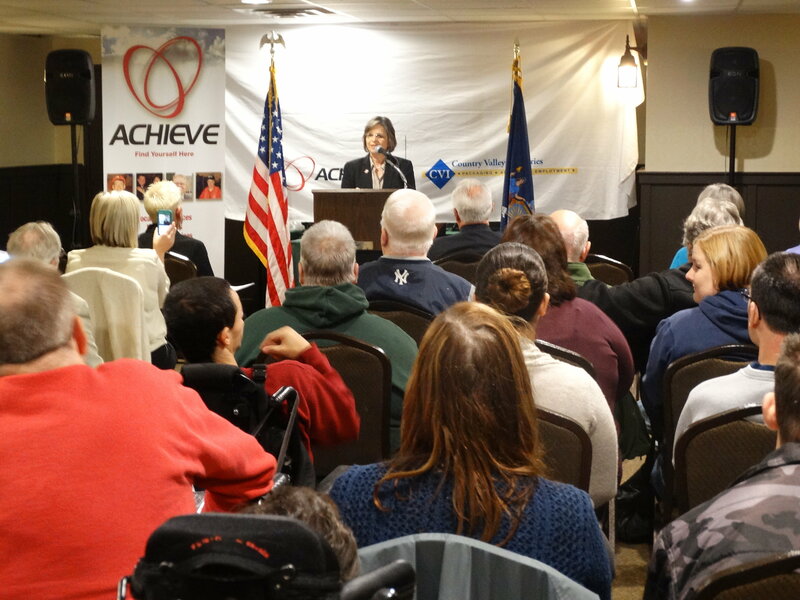 On October 24th, I also joined Assemblyman Cliff Crouch at a #bFair2DirectCare rally to advocate for increased resources in next year’s state budget for agencies that provide direct care to individuals who are developmentally disabled. These providers do very difficult work and their employees deserve wages that reflect their dedication. Rising Medicare costs and new federal and state requirements are making it more difficult for these providers to pay their workforce a decent wage. In fact, many are making minimum wage. As the transition from institutional care to community based settings began, I expressed concern that our local providers would lack the resources needed to serve this population and to pay their employees properly. Low pay creates a high turnover rate that is disruptive to consistent care. I will continue doing all I can to make sure these agencies receive the funding they need to provide the highest quality service to the clients they serve. Assemblywoman Lupardo speaks at a rally in support of increased funding for Direct Support Professionals. The week of October 17th was National Lights on Afterschool Week. For the second year the Expanded Learning Network of Broome and Tioga (ELN) celebrated local programs that serve students and their families outside the classroom. In 2014 I helped launch the ELN as a collaborative effort between government, schools, non-profits, and afterschool providers to share knowledge and resources in an effort to increase the availability of programming for students and families. This year, we highlighted the economic impact of afterschool programming. I joined the ELN and Jennifer Conway, President and CEO of the Greater Binghamton Chamber at a news conference to discuss how businesses benefit from these programs. 400 local businesses rely on afterschool; with their children in a safe and engaging setting, employees miss less work and are more productive on the job. Statistics also show that students who participate in afterschool programs achieve better grades, are healthier, more engaged in the community, and are better prepared for future careersTo learn more about Lights on Afterschool Week and the ELN, read this guest viewpoint by ELN coordinator Katie Bowers. 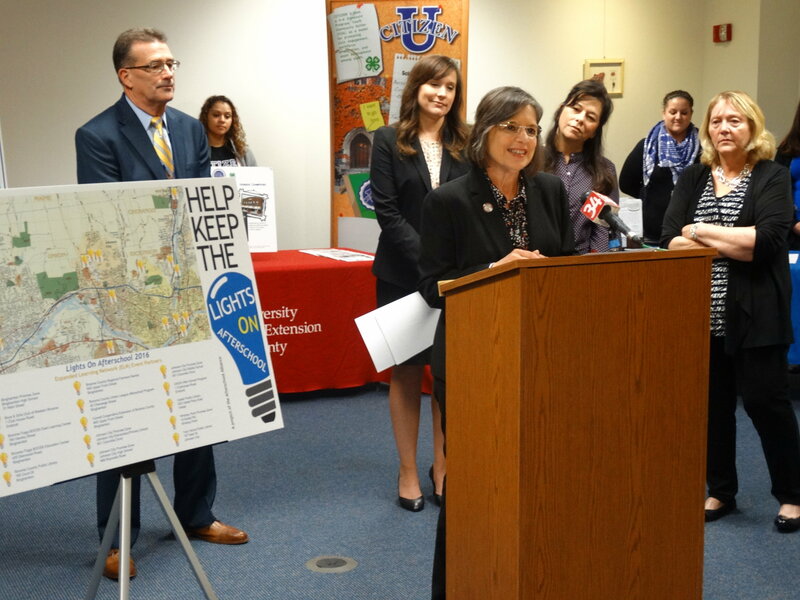 Assemblywoman Lupardo speaking about the benefits of afterschool programming to local businesses during a Lights on Afterschool news conference. As many local high school students begin to think about a career after graduation, a local event on October 5th gave them a hands-on look at what a job in construction might be like. I visited Construction Career Day, an annual event organized by the Department of Transportation that offers demonstrations and activities to allow students to learn more about careers in this field. More than 500 students participated this year and got a chance to talk to professionals, try their hand at carpentry and masonry, and even operate heavy equipment like front loaders and cranes. This event provides students with more information on the knowledge and skills necessary for the many good-paying jobs available in this field. 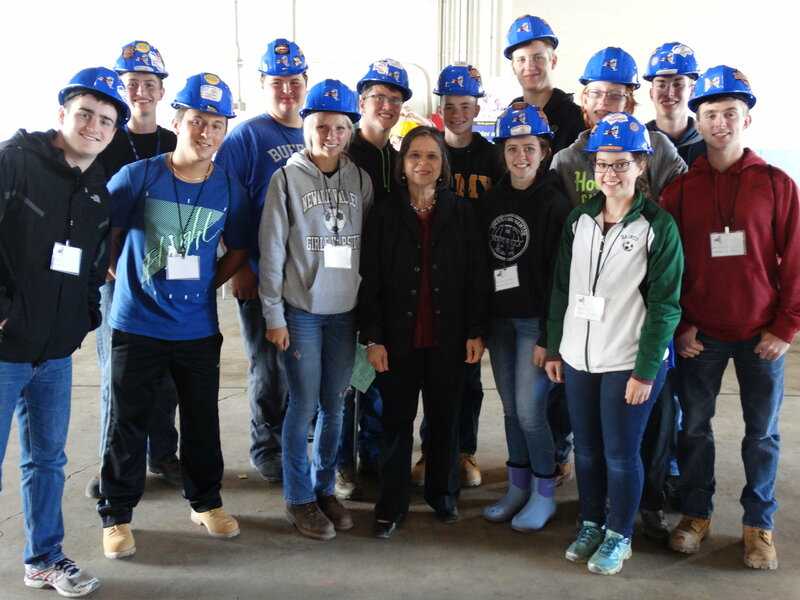 Students participating in Southern Tier Construction Career Day meet with Assemblywoman Lupardo. As October began, we received the good news that the Governor signed into a law a bill I introduced that will rename a portion of Route 434 the ‘Col. David Ireland Memorial Highway’ in recognition of a local regiment that helped save the Battle of Gettysburg. Col. Ireland trained the 137th NY Volunteer Infantry at Camp Susquehanna, which was located in the area of present-day Conklin Avenue in Binghamton. This regiment went on to fight courageously in a number of battles, most notably at Gettysburg where their nighttime defense at the right end of the Union line helped preserve victory in the War’s decisive battle. The 137th is memorialized at Gettysburg and at other locations in the South, but until this year there was no recognition for them in their own hometown. In June we dedicated a historical marker at Veterans Park on Conklin Avenue, which was attended by a number of local history enthusiasts and even some descendants of the 137th soldiers. The renaming of the highway is another long-awaited tribute to these local heroes and a ceremony for this dedication is currently being planned.